Join our free Heartfulness Webinar for GLOW. Get your Kindle book here. Now you can improve your overall health and boost your immune system with this easy-to-follow, colorful illustrated guide to a simple but powerful lifestyle change. 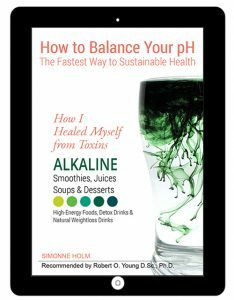 How I Healed Myself From Toxins: Alkaline Smoothies, Juices, Soups and Desserts will guide you to regain your vitality, in the fastest and easiest way, with over 130 tasty alkaline recipes with super nutrients for optimum health and wellness. Written in three parts, Simonne Holm offers you a clean and plant-based recipe book based on her own healing experience and many years of scientific studies. Full of delicious meals, soups, juices and smoothies this book will impact and heal your body from inflammations, teach you how to get a low-glycemic index, boost your immune system and prevent from all kinds of modern life diseases. Also, explore alkaline exercises, mindfulness, meditation and breathing techniques to avoid being consumed by a stressful routine and find your own way to a better and peaceful life. Alkaline High-Energy foods can help you achieve a proper pH-balance which is crucial for the overall health and for natural weightloss. Begin to listen to your body, mind and heart as a part of a healthy lifestyle. – and The Ultimate Challenge; A the simple alkaline start-guide that will help you into new habits daily and transform your lifestyle while pouring “super essential nourishing” detox drinks into your bloodstream and eliminating acid and toxins – an experience worth trying – if you are looking for natural weightloss, too. Take action now and start consuming rich high-energy foods in the easiest and most effective way – the alkaline super nutritious life-changing drinks! I am doing a small green smoothie in the morning, it feels sooo good! I can’t drink a lot of pureed raw veg or fruits this time year. It makes me too cold. I am freezing much of the time in the winter. We have a lot of rain now, everthing’s so green now, even flowers grow! I started adding 1/4 of a lime and the flavor’s so nice with parsley and cilantro. Also, chia seeds, coconut water for my acidy stomach from raw greens, and flax, kale or swiss chard, ginger to warm things up, orange and lemon wedges along with a little homemade almond butter. The fat also coats my stomach from the greens. Small amounts of everthing. It’s my new favorite thing in the morning. Thanks so much for inspiring me to get back into some clean drinks and balance! “Welcome to Alkaline Smoothies, Juices, Soups & Desserts! The pH-alkaline-balance is essential for your good health. To that end, it is crucial that what is healthy also tastes great.When healthy biochemistry meets the taste buds, and when the food is prepared with tender loving care, healing follows. Simonne Holm masters the art of making healthy food taste heavenly; it is easy to lead an alkaline lifestyle when it actually tastes wonderful. Most people are foremost guided by their eyes and their taste buds when they eat … and this is where this book offers such incredible inspiration. “I had the luck of running into Simonne when I felt my waistline was expanding and the weight was going in the wrong direction. Like many other I thought that I just had to spend some time in the gym and increase my daily exercise level to lose weight. But if that is your ambition I now know that 80% of your weight loss is connected to the food you eat. I’m pleased that Simonne via this book has been willing and able to share her waste knowledge about healthy food. What do you get – well a long range of healthy delicious recipes – enough to last for a while without getting tired. But what has perhaps been the best part for me was the Acid-Alcaline Food chart that makes it so easy to invent your own recipes and experiments. “Really enjoyed this book! It’s an easy read, providing a good and succinct review of why alkaline food matters. Then, the best part: a practical handbook-style guide for how to actually do it. I was already familiar with the topic, and having done some juicing over the years, but what was a very nice surprise was to find the hands-on steps for how to make it work in ones life. My favorite surprise was the advice on cleaning and processing all the fresh vegetables all in one big swoop for the whole week – this one suggestion will surely add more vegetables to my everyday diet no matter what. Food is fresh living energy, nature’s love for body and mind. Challenge yourself and get ready to experience what food is supposed to do for your wellbeing !! This book is nothing short of a miracle – I firmly believe it is going to improve life quality or even save lives if used well. Simonne Holm has developed delicious recipes on the basis of the scientific research of Dr. Robert Young. I thank you both. It is now possible to detox your body and treat it respectfully, also after a period of illness. During my detox training at the Alkaline-institute I have even experienced people who have been able to reduce their intake of medicine, through combining food with training.